Tomorrow in Paso Robles, the city celebrates the memory of Dr. Martin Luther King, Jr. Dr. Martin Luther King speaking at the Lincoln Memorial in Washington DC on August 28th, 1963. 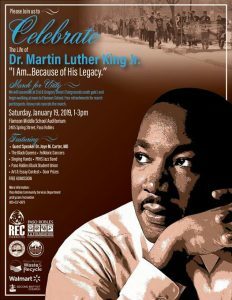 Tomorrow at Flamson middle school in Paso Robles, a celebration of Dr. King to be held from 1-3. Those who attend tomorrow’s event celebrating the memory of Dr. Martin Luther King, are encouraged to meet at the south entrance to the mid state fair at 21st street, and join a march of unity to Flamson middle school. The celebration of Dr. Martin Luther King will be presented from 1-3 tomorrow afternoon at Flamson school on Spring and 24th streets in Paso Robles.